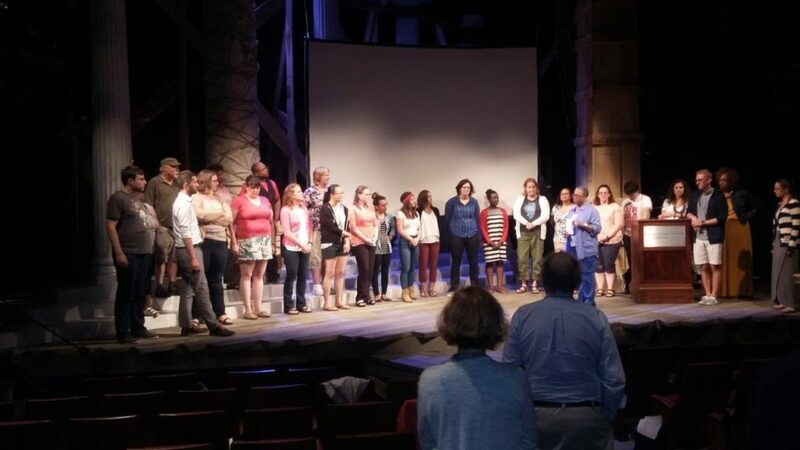 What’s it like to be an intern in the Teaching Shakespeare Institute? This summer we’re lucky to have three terrific interns at Folger Education: Shanta, a student at Trinity Washington University; Henry, a student at the Hotchkiss School; and Emma, a student at Swarthmore College. What a team! They’re hard at work as we wrap up the Teaching Shakespeare Institute 2016, our month-long flagship program for teachers, generously supported by the National Endowment for the Humanities. Since they and their peers are the future of the Folger, education, the arts and humanities, and the world in general, we love hearing their observations and insights, and we’re happy to share some with you today. Folger Education: Tell us about the coolest things you’ve experienced during your internship this year. Shanta: Being a part of the Teaching Shakespeare Library (TSI) this summer at the Folger has been an incredible experience so far. Everything that this program has offered me will be something I take with me throughout my life and career(s). However, I must say there are three that have to top the list of the coolest, craziest, mouth-gaping, and totally awesome things from TSI. First, it would be sword fighting class on the Folger lawn. I have never done anything like that before, and to see all the participants participate without nerves or shyness getting in the way was quite amazing. Also, I loved seeing joggers, those taking afternoon strolls, and even drivers stop to see the wacky group of people outside on a lawn fighting one another with really big wooden sticks. The second coolest thing was going down into the top secret, super duper Folger vault and touching a First Folio of Shakespeare’s plays. You know that moment when something amazing happens, and the golden lights from heaven shine down on you? That’s actually how it felt for me. What a great day. Last but surely not least, my top favorite thing here at the Folger is having the opportunity to listen in on all the lectures given by the outstanding scholars. The topics that they chose to focus on, and how they connect Shakespeare’s works to many different cultures, historical time periods, and more… it all fascinates me. My main reason for wanting to be a part of this program (other than to make lots and lots of copies) is to learn as much as I can about Shakespeare because growing up his sonnets and plays were not a big part of my education. In these past two weeks I have learned to appreciate Shakespeare a lot more and to discover more about him after the summer is over. Henry: Being a 2016 Teaching Shakespeare Institute intern is, by all accounts, one of the most interesting experiences of my young life. Being around a group of passionate, energetic, and talented teachers, as a high school student, is an inspiring experience. Being able to support this program and be a part of so many teachers’ educational awakening is a true gift. The first and, so far, most memorable moment that I have experienced at the Folger this summer was when Peggy O’Brien, Director of Education and Head of the Institute, took a group of teachers down into the rare book vaults to handle a series of rare books, proclamations, and manuscripts. Reading an original proclamation by Queen Elizabeth, written in the sixteenth century on vellum, designed to counteract the growing popularity of Mary Queen of Scots, was an experience that cannot be replicated anywhere else. The second event that impacted my experience at the Folger was Barbara Mowat’s lecture on the process by which Shakespeare is edited and synthesized into a common form for the Folger editions that millions of students around the country use to learn Shakespeare. As someone who has read most, if not all, of his Shakespeare from Folger editions, it was fascinating to learn about how the editors of the Folger texts construct and decide what to keep, what to gloss and where, and how to make these texts accessible and standard for all. Finally, I would like to mention something that is not so much a single event as a group of three that form a strong theme: Shakespeare in the modern age. The three events that have so shaped this theme have been the Folger Theatre’s production of District Merchants, an adaptation of The Merchant of Venice that takes place in D.C. during the 1870’s, a conversation with resident dramaturg Michelle Osherow, who worked on the play, and a reading of Caleen Jennings’ (who is on the faculty of TSI) play Playing Juliet/Casting Othello. Shakespeare is an inspiring resource with which modern artists are crafting beautiful pieces of protest and social awareness-inducing theater, making change along the way. This is one of the most important lessons and experiences that I have taken away from the Folger, and one that I hope stays with me for a long time. The Teaching Shakespeare Institute of 2016 has been a whirlwind in the best possible sense of the word. Ideally, I would like more sleep, yet I am more than willing to trade it for the exceptional experiences that I have been privileged to have among some of the hardest-working and devoted people I have ever had the pleasure to meet. These three experiences are just a few of the memorable ones that I have had so far, yet they are the three that stand out to me the most, as they are the three that have truly opened my eyes to the importance and power of the theater while simultaneously nurturing my love of Shakespeare and history. Emma: My absolute favorite part of TSI thus far has been the lectures. The resident scholars at the institute are all brilliant and provide insightful and thrilling analyses of text and reception which have significantly impacted my reading of Shakespeare. The guest lecturers have also been wonderful: we’ve heard from the famous Michael Witmore, the dazzling Ayanna Thompson, and the legendary Barbara Mowat. She was able to explain to us any and every decision she had made for the Folger editions, even down to her choices in punctuation. She’s basically my hero. (I’m not alone in this – after the lecture teachers lined up for her autograph like they were waiting to meet a rock star.) In the first week of the Institute, participants were taken down into the vault. The vault is an intimidating place – a large locked door, a rickety little elevator, high ceilings, and a noticeable chill. We walked past conservators vacuuming dust off books to see a First Folio and Queen Elizabeth’s Bible. The First Folio never gets old; I find it always as exciting when I first saw it in the glass case in a corner of the Great Hall. Being able to touch it and turn pages was even better. I’ve talked a lot about things I have learned from TSI, and the coolest parts of my personal experience. But I’ve also really enjoyed watching the participants experience the Folger and learn from each other. It’s really fun, of course, to watch them play scenes in dorky costumes and swordfight on the lawn. But this group has also had some really fabulous discussions this summer, as they deal with very difficult material in terms of the texts themselves (they’re reading The Merchant of Venice, Othello, and The Tempest). They’ve discussed race, religion, privilege, oppression, and the experience of being an outsider. I was particularly impressed during their conversation with Ayanna Thompson, where participants courageously and thoughtfully explored the intersections of privilege, teaching, and problematic plays. Their ability to open up and be vulnerable with each other has really struck me and has helped to form a well-knit community where they are able to be both goofy on stage and touchingly honest in discussion. I’ve never attended an institute before, so I don’t know if this is just the usual magic of TSI or this particular collection of extraordinary participants. I’m guessing it might be both. Announcing a Whole New Resource for Teachers!